Hey everybody, new to the forum from tennessee. First time Ford owner and I will never go back. 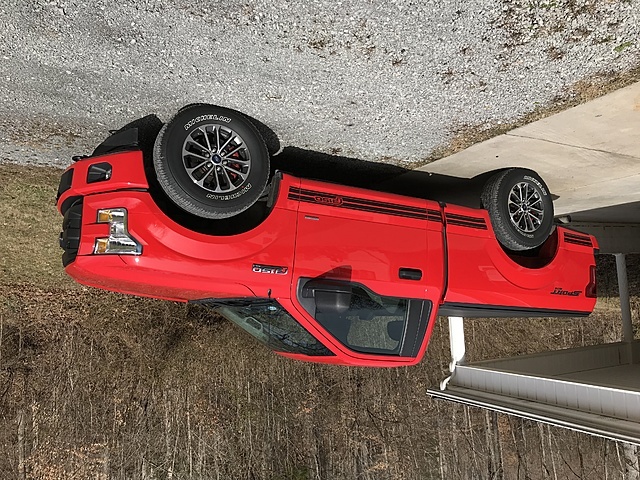 I have a 2017 rcsb with 101A package and 2.7 Ecoboost and am impressed every time I drive this little truck. Both power and fuel mileage are great! It came with the upgraded interior with carpet, sprayed in liner from Ford and the tailgate step. I added a toneau cover and upgraded wheels to the FX4 18’s. Tried to post a picture but its upside down?? Looking forward to learning new stuff about my truck. So far 38000 miles with no issues. Hate to see my truck on its roof!!! Last edited by LilRedRocket; 02-10-2019 at 10:39 AM. haa yea! Actually found a guy who does conversions on new trucks here locally for the dealerships and he sold me the new wheels and michelin tires for $800 for the set!